Launching at 7:20 p.m. from Vandenberg Air Force Base, the space booster that has defined dependability for two decades successfully shot the COSMO-SkyMed 4 craft into orbit. It's the last commercial mission currently booked for the Delta 2 rocket, which faces an uncertain future in the years ahead. Three launches carrying satellites for NASA will occur in 2011, but whether the program flies beyond next year depends whether five additional vehicles in inventory can be sold. "We are actively trying to market those. We have a lot of customer interest in the Delta 2," says Hieu Lam, Friday's mission director and Boeing Launch Services' Delta commercial program manager. "We have five left and we're working really hard to sell the last five. We'll know within the next year or two how successful we'll be in selling the last five." 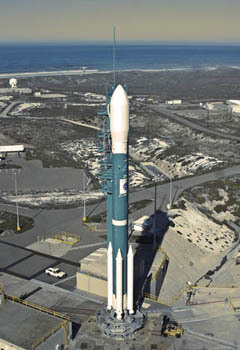 Over its 148 flights since debuting in 1989, the Delta 2 has carried a wide mix of payloads and achieved a remarkable 98.6 percent success record. The past has included 57 military missions, 46 commercial satellite flights and 45 launches with NASA spacecraft. But the Air Force, which spurred the Delta 2's creation in the late 1980s, has moved to other rockets, and the dwindling number of payloads suited for the vehicle's capacity have combined to create this situation. "This medium market, it basically dried up in the past few years. But we see it coming back pretty strongly in 2013-2014 and beyond," added Kris Walsh, rocket-builder United Launch Alliance's commercial program manager. "Both commercial and government markets recognize the Delta 2 is a very reliable launch vehicles. But there are other competitors coming on the market. So we just have to be very diligent in working with our customers in trying to get them onboard and buy the last five here," Lam said. United Launch Alliance conducted Friday's rocket flight while Boeing managed the commercial contract for the Italian customer. ULA was formed in December 2006 to merge Boeing's Delta and Lockheed Martin's Atlas rocket families under one joint venture to perform U.S. government space launches. The parent companies, however, retained the ability to sell the rockets on the commercial market, such as the COSMO flights. Since COSMO 4 was the last commercial Delta contract that it held, the outlook for Boeing Launch Services depends on selling the remaining five Delta 2's or inserting the Delta 4 vehicle back into the non-government marketplace. "Boeing Launch Services will be around in one form or another as long as Boeing has the responsibility to market the Delta launch vehicle. What it looks like will very much depend on the Delta 2 commercial sales, we have five left, and then the commercial viability of Delta 4," Lam said. In the broader sense of history, Friday's launch also represented the 350th flight in the Delta program's distinguished legacy stretching back to 1960 and the earliest days of America's efforts to reach space. Originally born from the Thor intermediate-range ballistic missile, Delta became a lifter of satellites for the nation and the world. "When you look back at the accomplishments of Delta 1, Delta 2 and now Delta 4, it's amazing," said Walsh. Evolutionary steps brought more power and capability as the rocket's family grew to newer versions, ultimately creating the Delta 2 that assembled the Global Positioning System constellation, launched inspiring science projects like the Mars rovers and supported many commercial efforts. The family name lives on with Delta 4, the modular line of rockets conceived as part of the Air Force's Evolved Expendable Launch Vehicle that today carry the country's largest and most important military satellites. "It's special, 350 is special," Lam said. "I started with Delta 178, so it's been 172 Delta's that I've been involved with in one way or another. I've been an engineer, mission manager or program manager. I've seen everything from the first Delta 2 to Delta 3 to Delta 4, and I'm very, very happy to have a career here with Delta." The purpose of Friday's launch was hauling the COSMO-SkyMed 4 satellite into its desired orbital perch, joining three sister-craft deployed by previous Delta 2 rockets in 2007 and 2008. 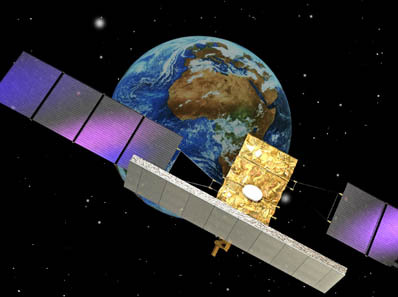 It is Italy's home-grown Earth observing system, a constellation of radar satellites built for civil and military reconnaissance in a flagship program carrying a 1 billion euro price tag. Developed by Thales Alenia Space Italia for the Italian Space Agency and the Italian Ministry of Defence, the COSMO-SkyMed system is the country's largest space project. 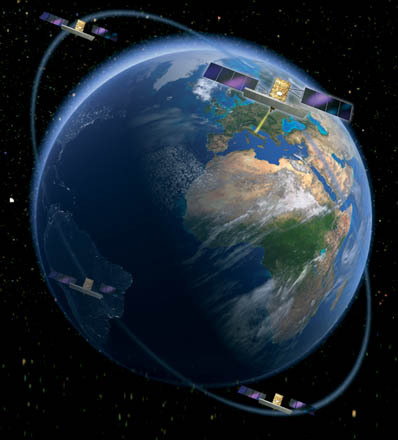 Each satellite is equipped with an X-Band Synthetic Aperture Radar instrument for environmental monitoring, resource management and territorial security surveillance. They are capable of seeing the ground in daylight or darkness, with clear skies or cloudy ones. The craft can produce 450 images per day and the picture-collecting time between civil and military uses is proportional to the financial contributions made during development of the system. The Italian Space Agency funded about 70 percent and the Ministry of Defence provided about 30 percent. Imagery released for civilian purposes have a resolution of 1 meter, meaning objects as small as that size can be seen. The military capability is even sharper, though its exact resolution is classified. The satellites have proved themselves beneficial to humanitarian organizations responding to natural disasters, such as hurricanes and earthquakes. The constellation of four satellites enables any specific region of the planet to be observed by COSMO-SkyMed every six hours. That allow authorities to assess and begin responding when a crisis strikes.